A few people asked how I survive long trainer rides, so I wrote about the general things I think about as well as what I specifically did last weekend on an indoor 3+ hour, 50 mile ride. My preparation for this ride was really similar to when I did a 100 mile trainer ride last year. Both involved pushing past my current PRs and constraints, and both were a struggle. Long story short, the concepts are the same whether you’re doing your first solid hour on the trainer or a mega-ride! “Long” is however you define it, but to me it means pushing past your current near-term PR, whatever that may be. I have been slowly building up time in the saddle since surgery and decided that a 3-ish hour ride would be a significant accomplishment! Don’t forget to caffeinate before your ride! The most important thing I do before a long trainer ride is to remember to treat it as seriously as I would an outdoor ride. That said, riding indoors is not the same as riding outdoors, and it never will be. It recruits different muscles, your constraints are different, and you will likely encounter different issues than you do outdoors. Start your preparation the night before — I ride worse if I’ve had alcohol the night before, so if I want to feel my best on any ride the next day I skip an evening beer. I also focus on getting decent rest. Riding the trainer is mentally harder than riding outdoors so I need all the help I can get. I make sure to have everything prepped before I jump on the bike. Are you fueled? Do you have snacks handy? Do you have enough water? Is your fan on? Are you kitted up, and have you applied chamois cream if that’s your thing? 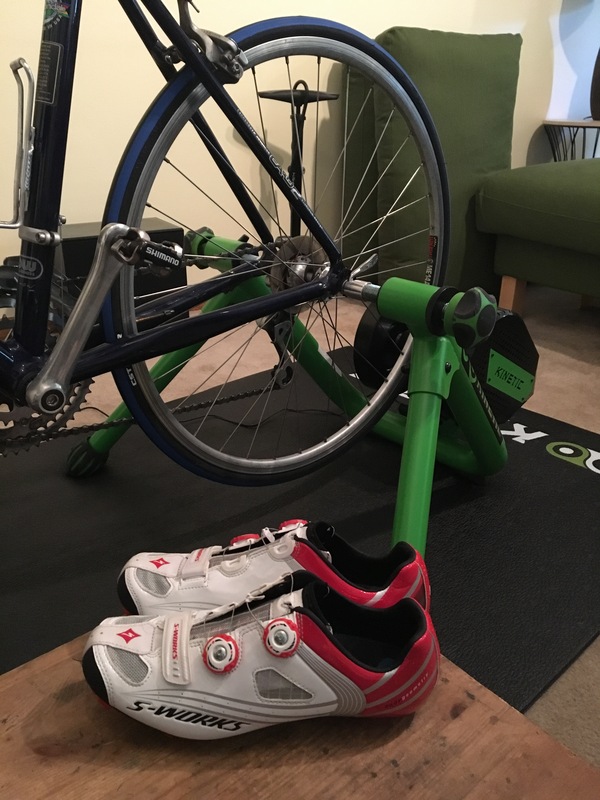 My trainer set-up — a “Smart Control” trainer by Kurt Kinetic REALLY makes indoor training less monotonous. Set a start time and a goal. 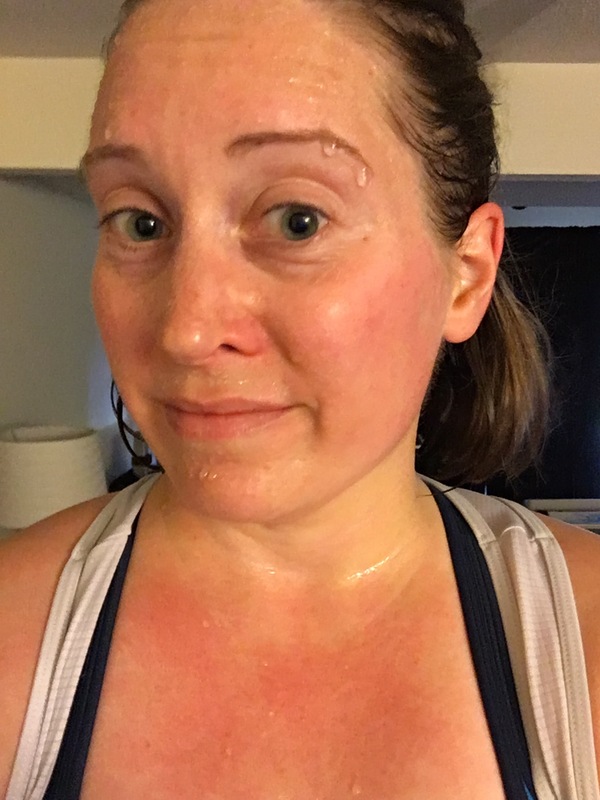 I use Zwift to cycle with others virtually, and it really helps me if I’ve committed to meeting someone on the course, even if we don’t plan on staying together the whole ride. 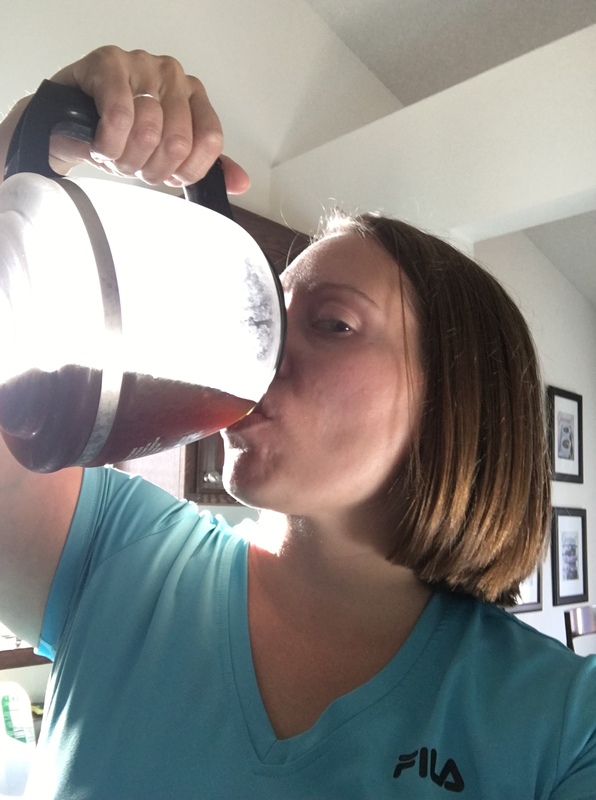 Much like an outdoor group ride, it gives me a defined start time and helps thwart that urge to have just another cup of coffee…. Specific goals are important too. If I’m sitting down to “just ride for a while” my ride isn’t as productive and I tend to bail sooner. I try to have one goal that addresses duration (mileage or time) and another goal that addresses intensity (heart rate or speed goals). I skipped an evening beer on Friday night and also ate foods that agreed with my sometimes fickle stomach, and then went to bed early-ish for a Friday night. I set a start time and was meeting someone “on course” in virtual Zwift world at 8:30 AM. I planned to ride with him for a while, and then peel off at some point to do my own thing. I knew he was also trying to ride long that day so I wasn’t worried about him taking off at breakneck speed. I ate a good breakfast, which for me is a mini bagel, slice of cheese, and a soft cooked egg coming in around 330 calories with a combination of carbs, fat, and protein. That meal is on the lower end of the number of calories I’ll eat before a ride. I’ve worked over the last year and a half to need fewer calories while biking (it’s a work in progress) so your caloric needs may be significantly different from mine. I wasn’t kidding when I said I sweat A TON! I got on the bike, met my friend at the appointed time, and we rolled down the virtual road. I have the giant fan on a WeMo switch that can be turned on and off by a cell phone app. I love it! The fan is powerful enough that if I turn it on when my heart rate is low, I’ll actually feel chilled. I toggle the fan on and off in the early phases of the ride to keep me most comfortable. I had snacks staged on a stand next to the trainer for in-ride fueling. First was a 250 calorie Starbucks salted caramel mocha drink for a 1-2 punch of caffeine and sugar near the 1 hour mark, and the second was a maple roll coming in at just over 200 calories that was consumed near the 2 hour mark. I had two full water bottles staged by the trainer and I didn’t even finish them; I definitely didn’t drink enough on this ride. The industrial fan evaporates sweat and it’s easy to get in the zone and not hydrate properly. I was feeling dehydrated for the rest of the day! Next time I want to force myself to drink 2-2.5 bottles in a 3 hour period. Trial and error is your friend. I didn’t change my chamois during this ride or apply extra chamois cream, and let’s just say I should have. Three hours may be my limit in 1 pair of shorts on the trainer. I sweat A TON so the chamois gets drenched even with the industrial fan pointed straight at me. I get more evaporative cooling and less pooling of sweat on outdoor rides. Motivation during trainer rides is key. I mentioned having specific goals for your ride, and that’s one thing that kept me going last weekend. I had in my head that I wanted to try to ride for at least 2.5 hours and keep my HR above a certain number, but would allow myself to bail if my back acted up. Zwift provides extra motivation — I love finding riders on course that are riding close to my target pace, and then trying to stay with them or even chase down other riders. I also have an Amazon Echo Dot staged near the trainer with a music subscription, so I could yell out random music requests and hear them immediately! I’ll miss the free music subscription when the trial runs out, then it’s back to a 200+ song playlist on my phone. During the final hour of my ride, my boyfriend appeared and rode his trainer which is staged next to mine. It was nice to have someone to talk to as it helped keep my mind off of how my legs were feeling! How each person survives long trainer rides is different, but hopefully what I’ve posted above will help you achieve a new best! Comment with other things you do to make trainer rides more fun and rewarding, or let me know what your next trainer goal will be! Great blog Melissa. I’m glad ypu mentioned treating it like an outdoor ride as I do approach it differently. I don’t use nutrition or gels and only take water while on the trainer. I would not survive if this was outdoors. I’ll be looking to change that up especially for Saturday. I also blog once in a while, check out http://www.upandrunningwithdeb.blogspot.ca if you get a chance.